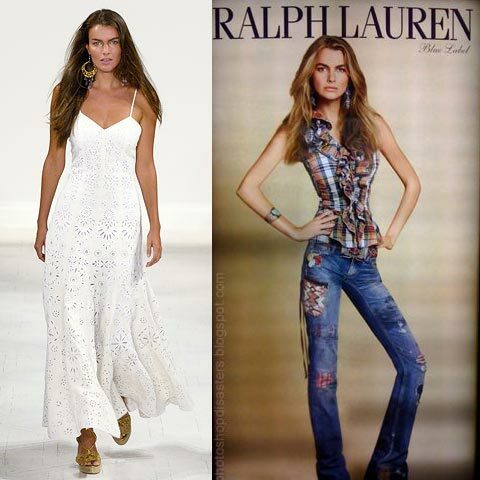 Filippi Hamilton on the catwalk on the left and photoshopped on the right. I read the recent Glamour magazine article, “Shocking Body-Image News: 97% of Women Will Be Cruel to Their Bodies Today” and it made me think of my daughters and all the young boys and girls, teens, and women who have or will struggle with self-esteem and body image issues at some point in their lives. These are very disturbing statistics. More than ever before, the body hatred epidemic is beginning at a younger age. How can we stop this? A few ways we can help break the cycle are by loving and accepting our bodies the way they are, setting a good example for our children by not talking negatively about our bodies, not buying into the false imagery the media is selling, giving kids the tools they need to build their self-esteem and confidence, and having conversations with our kids about the reality of the artificial images and messages they are exposed to. I also think we should have more diversity in the media. The recent rise of plus models have helped expand the idea of beauty and acceptance, but I wish those women were used alongside straight models with more regularity. I also hope to see more un-manipulated pictures of men and women of varying shapes, sizes, ethnicities, physical abilities, and ages, which includes people who are short, tall, plus, thin, and every woman in between. Is that too much to ask? We live in a society where the media, magazines, and some celebrities are sending unhealthy unrealistic messages about the definition of beauty. We see pictures in magazines of unattainable beauty—it’s not attainable because it’s fake. Sometimes the models in the pictures are airbrushed and computer enhanced to the point of absurdity (as seen above). Women, girls, boys, and men are being sucked into illusionary expectations of beauty and the effects of that can be very damaging psychologically and physically. The effects of the unrelenting images and messages can lead to low self-esteem, body image issues, eating disorders, unhealthy living, and in some cases death. No, I’m not being overly dramatic. According to the Department of Health, “It is estimated that 8 million Americans have an eating disorder – seven million women and one million men. Anorexia is the third most common chronic illness among adolescents. 95% of those who have eating disorders are between the ages of 12 and 25. 50% of girls between the ages of 11 and 13 see themselves as overweight.” A study by the National Association of Anorexia Nervosa and Associated Disorders reported that, “5 – 10% of anorexics die within 10 years after contracting the disease; 18-20% of anorexics will be dead after 20 years, and only 30 – 40% ever fully recover”. This is reality. Women and men are dying to be “beautiful”. I recently heard Oprah interview Janet Jackson about her new book called, “True You”. Janet talks about going through a phase in her life when she hated her body so much that she would literally bang her head against the wall out of frustration. When Oprah asked when Janet thought her body hatred started, Janet said it started as a child. She said that her brothers would tease her, not realizing what a profound negative affect it was having on her psyche. She has struggled for years to recover. Everyone has their own potential trigger, whether it’s teasing from peers or family, images in magazines or shows, peer pressure, or a parent who spoke negatively about their own body in front of their kids or who didn’t treat their bodies with respect. Unfortunately, this is the story of many men and women both famous and not. We should encourage and empower boys, girls, women, and men to break the cycle of negativity and self-hate and to love and embrace their bodies as they naturally are. It took me a long time, but once I decided to embrace my body as it is, my confidence has soared! I feel more empowered now and have such great respect for what my body is capable of doing. With so many people struggling to love themselves, it makes me think something needs to radically change. How can we put a stop to this? Who defines beauty? What drives the media? How do you define beauty? I define beauty as the inner light that shines through your eyes, smile, laugh, words, actions, and touch. The light that is lit by love, kindness, patience, joy, intelligence, hope, strength, a warm heart, and confidence in your unbound uniqueness. Here is the full Glamour magazine article.